Gambier resident Audrey Fenigstein, Ark designer and builder, reads a statement at the Ark dedication ceremony, December 23, 2007. Hillel director Marc Bragin looks on. The Jewish Cemetery Society of Knox County (JCS) was established in 2010 to regulate and maintain a Jewish cemetery and assist with burial in accordance with Jewish tradition. A group of Kenyon College faculty and staff and community members met together for several years to plan the establishment of a Jewish cemetery, in conversation with Kenyon alumni. JCS has established a partnership with the College Township trustees and the Friends of the Quarry Chapel. The cemetery officially is an expansion of the existing township cemetery, which adjoins Quarry Chapel. Included on the National Register of Historic Places, the chapel has been deconsecrated and fully restored; it is now used for weddings, memorial services, and other private events. 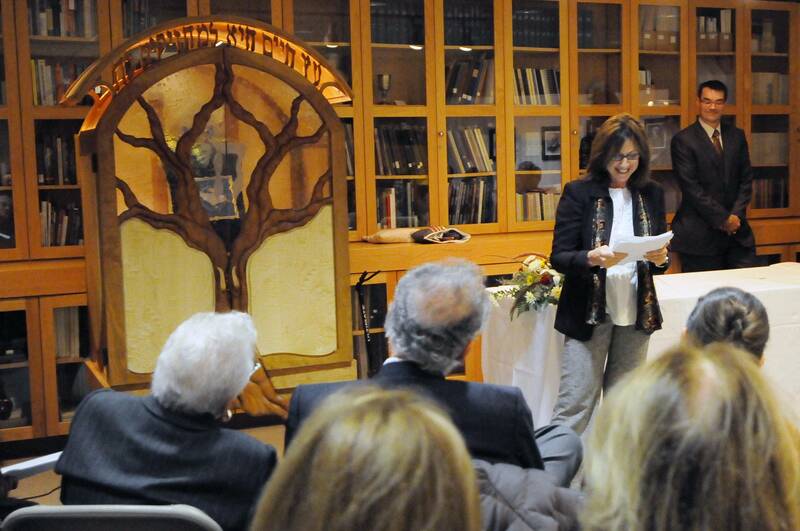 The chapel will serve the needs of the Jewish community as a location for memorial services. JCS funds are administered by the Community Foundation of Mount Vernon & Knox County. The Community Foundation is a collection of individual philanthropic funds established by Knox County residents for a wide variety of charitable purposes. This partnership provides professional fund management for JCS and enables contributors to receive tax benefits for their donations and plot purchases. Many thanks to the members of the JCS steering committee, who worked together with dedication and patience over the years to bring this cemetery to fruition. We also received invaluable consultation from other Kenyon community members and from Kenyon Hillel. A 2013 Mount Vernon News article publicized the planning and realization of the cemetery.